A vendor arranges portraits of Pope Francis outside of the Lubaga Cathedral in Kampala, Uganda, Nov. 13, 2015. Pope Francis' pending visit to Africa has created quite the buzz, feelings that may be summed up by this gushing review from Tsoholofelo Legodi, a 21-year-old parishioner at Johannesburg’s largest Catholic church, Regina Mundi. “I love him!” she said. Francis' first visit to Africa since becoming pope in 2013 follows a trip to the United States earlier this year that drew huge crowds and praise for his tough statements on topics like the need for greater environmental stewardship. 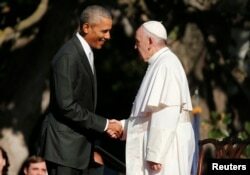 The pope met with President Barack Obama, spoke to a joint meeting of Congress and made remarks about what appears to be his signature issue: global inequality. U.S. President Barack Obama, left, greets Pope Francis upon his arrival at the White House in Washington, Sept. 23, 2015. This coming trip to Kenya, Uganda and the Central African Republic has him visiting three countries all too familiar with inequality and tough issues like climate change, inter-communal conflict and Islamic extremism, which the pope is expected to address. Pope Francis, while seen as more progressive than his predecessors, appears to be following a papal tradition, not shying away from making bold pronouncements, visiting countries with troubled histories, and even criticizing his hosts. 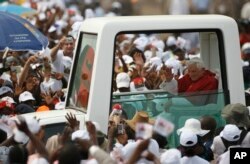 Pope Benedict XVI arrives in the popemobile to celebrate a mass on the outskirts of Angola's seaside capital, Luanda, March 22, 2009, the last major event before the end of the visit. Benedict drew criticism during his first visit to Africa, for saying condoms were not the answer to the continent’s AIDS crisis. He said the epidemic “cannot be overcome through the distribution of condoms, which even aggravates the problems." Enraged health organizations accused him of aggravating the fight against HIV with his comments. Pope Benedict XVI waves to the Catholic faithful as he departs following Sunday Mass, at the national stadium in Cotonou, Benin, Nov. 20, 2011. On this two-day visit to this small West African nation, the Pope signed Pledge for Africa, known in Latin as Africae Munus. This lengthy document charted the future of the church in Africa, covering issues as diverse as healthcare and the Internet, and was outspoken on social issues like illiteracy and gender equality. Pope John Paul II was the most widely travelled pope in modern history. In all, he visited 38 sub-Saharan African countries during his 27-year pontificate. 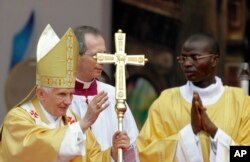 His tenure coincided with strong growth of the church in Africa. Pope John Paul II meets with the Archbishop of Canterbury Robert Runcie, left, head of the Anglican Church, in Accra, Ghana, May 9, 1980. 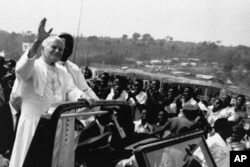 Pope John Paul II visited six African nations on his inaugural pastoral trip to the continent: Zaire (now the Democratic Republic of Congo), Republic of the Congo, Kenya, Ghana, Upper Volta (now Burkina Faso), and Ivory Coast. 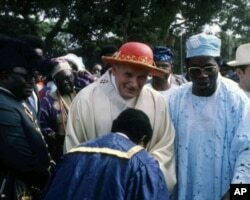 Pope John Paul II is greeted by an official during a visit to Ibadan, Nigeria, Feb. 15, 1982. This trip to Madagascar, Reunion, Zambia, Malawi drew controversy over his comments on condoms and the AIDS crisis, when he said, “it seems profoundly damaging to the dignity of the human being, and for this reason morally illicit, to support a prevention of AIDS that is based on a recourse to means and remedies that violate an authentically human sense of sexuality..."
Pope John Paul II waves to the faithful before celebrating an open Mass in Kabgayi, 60 kms. southwest of Kigali, Rwanda, Sept. 8, 1990. The pope’s first official visit to South Africa was preceded by a 1988 incident that angered the nation’s racist apartheid government, which Pope John Paul II had repeatedly criticized. The pope’s plane was forced to land in South Africa because of bad weather, and he refused to kiss the ground upon landing. Things had changed by 1995, after South Africa ushered in a democratic, inclusive government. He recognized that, saying, "Today my journey brings me to a new South Africa, a 'rainbow nation,' indicating the diversity of races, ethnic groups, languages and culture which characterize it." He was received by President Nelson Mandela, who praised the pope’s stance against apartheid, "To say this visit is long overdue is to pay tribute to your own abhorrence of the system of apartheid." 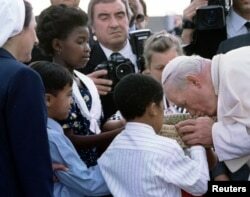 Pope John Paul II kisses a basket of South African soil presented to him by four children of different races as he arrives at Johannesburg International Airport, Sept. 16, 1995, at the start of his first official visit to the country.